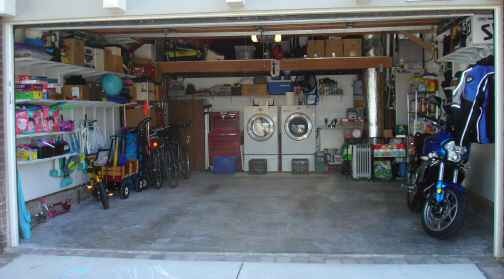 Are you about to take on a huge garage organizing project but not sure where to begin? The garage is one of those places (much like basements) where things just seem to pile up, literally. It’s so easy to throw things into this large space perhaps to never be seen again. I know for me, it’s very easy to open the door that goes into the garage and toss something in there to be dealt with or put away later. And before long, there is an obstacle course to get through the garage. The other thing about garages is that they are a multipurpose room. A garage is often a storage area, laundry room, work shop, game room, and sometimes, even a place to park a vehicle or two! Let’s talk about the basic guidelines for garage organizing. I honestly don’t know how people tackle a job like garage organization in a single day. I personally wouldn’t recommend the method of taking every single thing out of your garage and then putting things back in neatly. Unless you can send the kids to Grandma’s house and be sure the neighbors aren’t going to stop in to chat, you’ll need to do the garage in sections. Not to mention, it’s less exhausting in the long run. Besides, you didn’t turn your garage into this mess in one day, it probably took years, so don’t try to rush yourself if you’re not honestly up to it. I would recommend working on a section of your garage at a time… be it one corner piled up of stuff or a particular area of shelves. Big benefits don’t only come from major overhauls… they can come from small sections of improvement as well. Just imagine getting a clear path to your car or laundry. That alone is a big improvement! Car storage Laundry and supplies Excess sodas/foods Excess household items (paper towels, toilet paper) Household cleaning supplies Car cleaning supplies Kids outdoor toys Bikes Sporting gear Gardening supplies Workshop area Tools and tool chests Paint, supplies and tools Holiday decorations Luggage storage Memorabilia Old things you just don’t know what to do with so you chuck them in the garage. Boxes of unopened things from when you moved in! Now, think about how you WANT to use your garage, and just what kinds of zones you’re going to need for all your things. Make yourself a list of your intentions so you have a solid idea of where you’re headed with your garage organizing project. Once you get going, your goal is to put like things together…(ex. gardening and yard supplies in one section, car care supplies in another, etc.). Once you’ve decided on a section to work on, pull that section out and sweep it or wipe it down. Declutter your belongings that you pulled out of that area. Remember the idea to use large boxes, or sections of driveway to sort into piles of Keep, Toss, Donate, and if you’re up to it, Sell. A very important part of garage organizing is selecting the appropriate storage products for your needs. You need to determine what types of shelves, cabinets, hooks or containers suit your needs best for particular areas. There are storage products for all types of uses and for all budgets. Be sure to think vertical! Horizontal space can be very limited in a garage, especially if you plan to park a vehicle or two in there. So think about shelving to store upwards. Click here to see a very simple example of how a few vertical shelves can make a big difference. Also consider systems which allow you to hang items on a wall. And don’t forget those overhead rafters…. there is storage space there as well. Another way to use overhead space is with ceiling mounted lifts. If you have the budget, there are some fabulous professional garage organizing systems on the market. Some you can install yourself to save some money, while others install the systems for you as well as help you design your new garage. If you don’t have the budget, you can consider using old dresser drawers in the garage, or old kitchen cabinets. Sturdy disposable diaper boxes that have handle cut-outs make great storage bins for items (you can put contact paper over the Dora and Diego faces if you prefer). Be creative! Now that you know what you have for a particular zone, think about where that zone would be most functional. Things you use often should be kept at an easily reachable level, items you use rarely can go higher up, such as seasonal items. Kids daily outdoor items should be easy for them to access and put away. Tools go by the workbench area, laundry products by the washer and dryer, etc. Give everything a spot to live… it’s much easier to put things away when you know where they go and they’re easily accessible. It really helps to label things once you get them in order. It’s much easier to stand in the garage and know what’s on every shelf and what’s in your crates or bins on those shelves. It’s a good idea to label the bins/boxes/crates themselves so that if you need to move them, the label goes right along with it. Labels also help with putting things away when you’re done with them, since you know right where they go! If your garage is nicely finished with drywall, you may consider a fresh coat of paint to spruce up the place! Be sure to use exterior paint to withstand the temperature fluctuations and humidity typical in a garage. Color coordinate containers if appropriate. We keep the Christmas seasonal items in clear containers with red/green lids. The Halloween stuff is in clear containers with orange lids. You can also color coordinate the various zones of your garage if that’s suitable. Consider storage products with closing doors that you’re able to lock for storing hazardous items such as cleaning supplies and flammable items. If you can’t, then at least consider storing all dangerous items out of reach of children. Garages can be damp and things can get spilled. It’s always a good idea to store things just off the floor surface, even if it’s only stacking things on a couple two by fours. Who couldn’t use a small (or large) workbench area for taking care of household projects? It’s nice to have a designated workspace with your tools nearby, that’s off the floor. It’s definitely something to consider, even if you have limited garage space. If you follow these guidelines for garage organizing and give yourself the appropriate amount of time to work on it, you WILL organize your garage. You’ll gain a real sense of pride and you’ll be happy with your newfound space. Remember, a garage is part of the home, therefore, it should be as organized and cared for as the rest of your home. It’s as much a reflection of your life as the rest of your home. More about Garage Organizing - Sheds and Basements too! 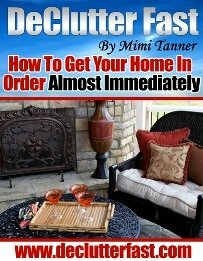 Here are some additional pages related to garage, shed and basement organizing. Especially fun are the before and after photos!